In late Aug 2010 the VLSI Packaging Workshop of Japan, held every other year since 1992, became The International Symposium on Components, Packaging, and Manufacturing Technology (IEEE CPMT Symp Japan) with a Conference at the University of Tokyo. Hirofumi Nakajima of Renesas was the Chairman. 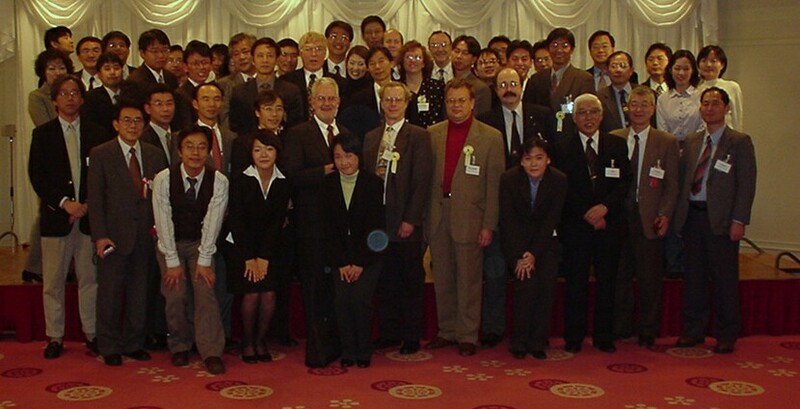 VLSI Japan was an outstanding technical conference which promoted the sharing of information and ideas through the 1990’s and 2000’s. My own memories bring me back to the 2000 VLSI meeting that George Harman, Len Schaper, Jan Vardaman and I attended from the US. After far too much Sapporo black label at a conference karaoke party, I recall Len and I led the group in singing “Hey Jude” (everyone in the world knows the words to this Beatles oldie). There were several interesting and informative 3D related papers presented at the IEEE CPMT Japan Symp this year that are worth reviewing. 3D stacks are usually joined by metallic bonding using techniques such as solder or Pb free solder bumps, Cu/Sn eutectic or Cu/Cu thermo compression bonding. Non conductive underfill can be used to fill in the space in and around the interconnections to mechanically support the interconnect. It is difficult to flow traditional underfill materials into such narrow gaps and to control material flowing out from the chip edges. Pre applied non conductive filler (NCF) doesn’t need to flow into the small gaps or flow out over the chip edges. Lamination on structured surfaces demands a fluid nature for the NCF while a rigid material is required for dicing. This combination of properties can be obtained from materials that have temperature dependant viscosity. Such NCFs can flow into the narrow spaces between bumps and be cut with a standard dicing saw. Pre applied NCF must be transparent, to allow viewing of alignment marks, and must not remain between the bump and the pad during bonding. Toray developed a transparent, low CTE underfill by using nm sized filler particles as shown in the figure below. 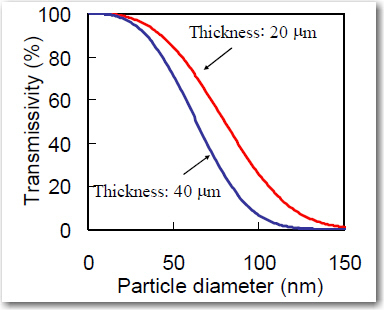 To get transparency from a less than 20 µm film requires filler particles less than 50 nm . 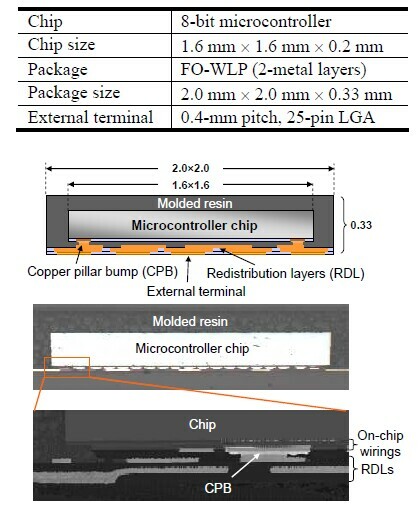 Toray has achieved optical transparency, a CTE of 37 ppm/C and a 1% wt loss temp of about 350 C.
To insure that the bump / pad area is clean during bonding, the chip with NCF should be heated up to the temp where the NCF changes to a flowable liquid and then pressed into contact with the pad on the other chip in the bonder. As an alternative solution Toray has also developed a negative tone photo NCF to insure the contact areas are free of underfill material during joining. The material flows at ~ 200 C and has a 1% wt loss temp of 300 C.
When filling TSV with Cu, the overburden is usually removed using CMP. The Cu thickness and topography requires a optimized Cu CMP process for removing the thick Cu layers. Hitachi studied friction force requirements and chemical additives for various slurries in order to develop a high speed removal process specifically for 3D processing. The table below shows both the target values and the ultimate product (HS-C935) performance. 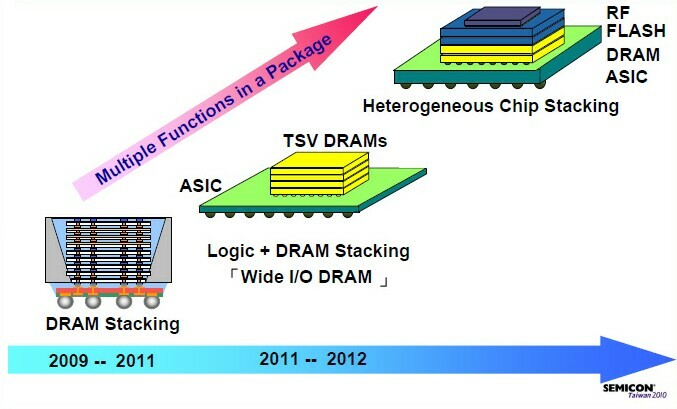 We have discussed Japan’s ASET consortium several times in the past [ see PFTLE 104, “3D From the Land of the Rising Sun”] For the Dream Chip program Renesas and Rohm are studying thinning and pick-and-place technology for die to wafer constructions. Their specification is to achieve 10 +/- 1 µm wafer thickness stability after thinning and dicing 300 mm wafer devices. Thinning to 10 µm requires a hard support (carrier) and an adhesive that would both be uniform and is thermally stable enough to resist degredation during grinding and backside processing. 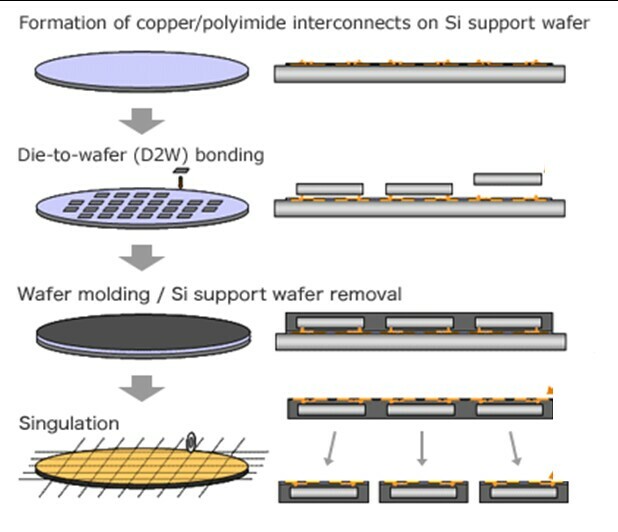 To achieve the 10 +/- 1 µm 300 mm wafer thickness,variation must be controlled in the Si wafer, the adhesive and the carrier as shown below. Epoxy adhesive with a reported thermal stabilty of 200 – 230 C was examined. After thining to 10 µm no edge chipping or cracking was observed, but swelling of the adhesive and resultant cracking of the thin Si is seen when the adhesive is baked for an hour at 230 C so in reality the material for this application is really only stable to 200 C.
Pick and place of these thinned chips is also a significant technical issue. They evaluated the slide-and-peel method shown below. When the chip overhang is small the adjoining chip is damaged during the pick operation. When the overhang is to large the lower vacuum attach area becomes too large and he chip cannot be picked up. Conditions were found where the chips could be picked up by the vacuum collet. Although it will require significant engineering, it appears that there are no insurmountable challenges when it comes to thinning and pick up. It will be very interesting to see the details on the stacking step ! MEPTEC will be having a “ Semiconductor Packaging Roadmaps: Applications Driving Requirements” symposium on November 10 at the Biltmore Hotel in Santa Clara,CA. You can find out more about this meeting at their web page. For all the latest information on 3D IC and advanced packaging technology stay linked to Insights From the Leading Edgeâ??¦â??¦.. Continuing our look at the Semicon Taiwan 3D Technology Forum held a few weeks ago in Taipei. In the past, SPIL has been rather silent about their plans for 3D IC. During his presentation at the 3D Forum, Carl Chen, VP of R and D, remarked that TSV solutions will be used short term for form factor driven reasons , mid term by performance and long term for cost considerations. This sequence is dramatically similar to the acceptance of wafer level packages (WLP) in the last decade. 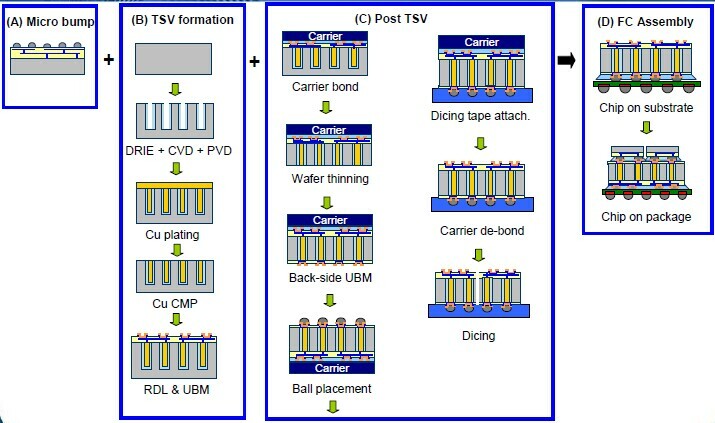 Siliconware is calling their 2.5D interposer “TSI” for through silicon interposer. They offer the following chip-to-chip (interposer) and chip-to-wafer (interposer) sequences. 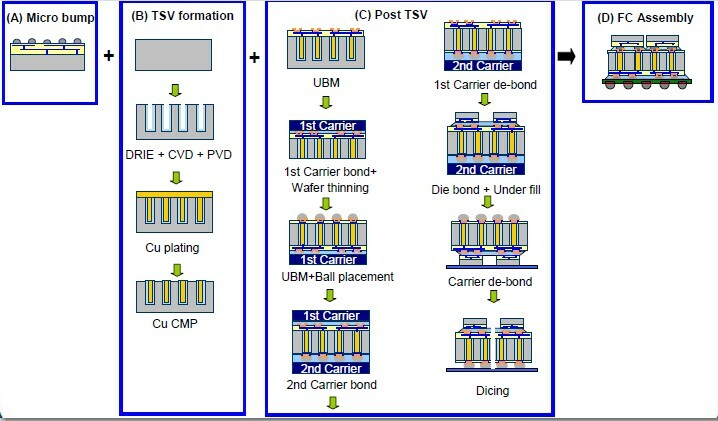 The current status of their copper pillar joining technology is shown in the figure below. 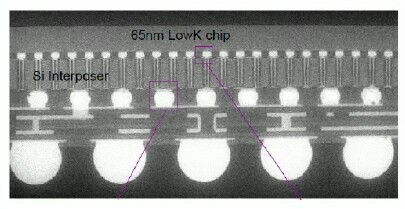 Nokia has been using MEMS microphones and camera modules both fabricated with TSV since 2006 and 2007 respectively. Kauppi Kujala, Sr Tecnology Mgr at Nokia reports that memory stacking with TSV can offer miniaturization opportunities, performance improvements and power reduction. 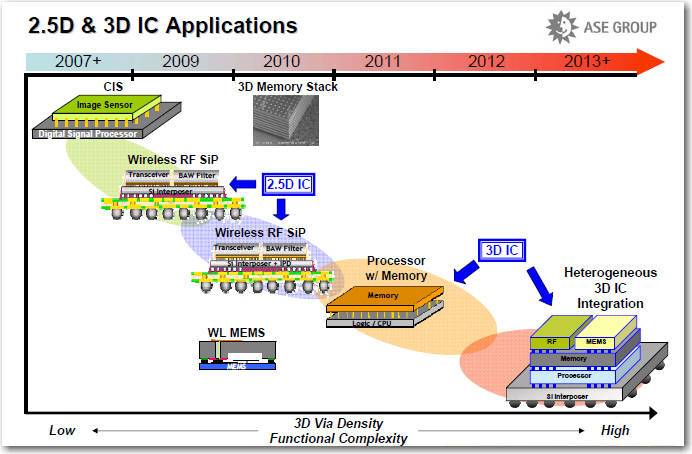 Nokia currently sees wide I/O memory mating with logic devices as one of the main drivers for 3D IC adoption. Kujala proposes a single package with up to 4 DRAM for smart phone applications. Kujala sees Interposers (2.5D) being driven by die /substrate pitch miss match and low K mechanical fragility. Kujala, however warns that cost will be a major item in the adoption of interposers for 3D. Nokia sees the need for standardization in areas like chip interfaces. 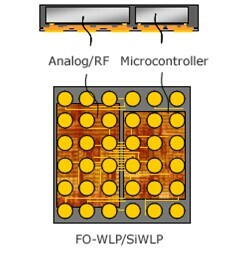 Nokia is very supportive of JEDEC wide I/O standardization which reportedly will be ready in late 2011. JC Eloy, CEO of Yole released their newest roadmap showing timing including initial qualification and first product on the market. Fabless Qualcomm has been a strong proponent for 3D IC over the past few. 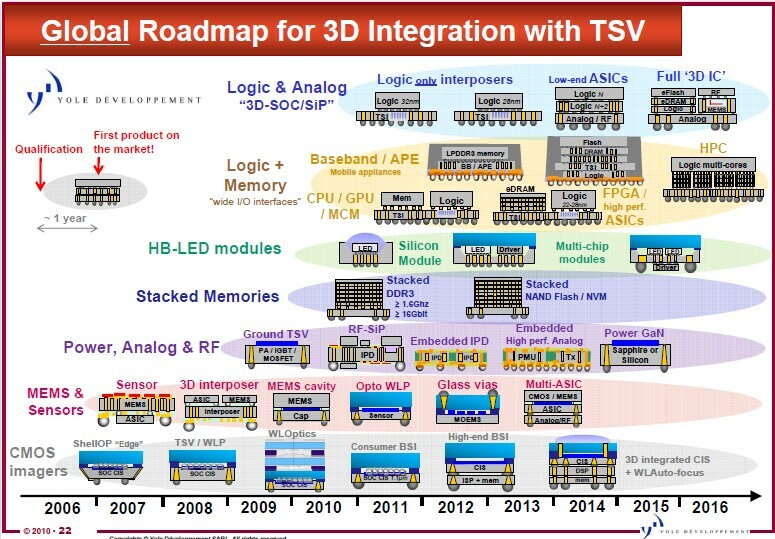 At Semicon Taiwan 2010 Nick Yu, VP of Engineering indicated that Qualcomm would like to see 3D HVM with 3D IC by 2013. Qualcom is also a strong proponent of standardization in order to accelerate adoption of the technology. Qualcomm is suggesting specific standards in the following areas and suggested which standards bodies (JEDEC, Sematech, Semi, IEEE, Si2, ANSI) should be involved. For all the latest on 3D integration and advanced packaging stay linked to IFTLEâ??¦â??¦.. You are currently browsing the Insights From Leading Edge blog archives for October, 2010.